2. Off Exit 77, turn left and follow Route 39 East for approx. 6 miles to traffic light. 3. At traffic light, turn right and continue to follow Route 39 East (Hershey Park Drive). 4. Follow signs to Hershey, taking Route 322 East (toward Ephrata). 5. Continue on Route 322 East for approximately 3 miles. 6. At traffic circle at the intersection of Meadow Lane and Route 322, turn right onto Meadow Lane. available parking area. Follow the signs to the event area. 2. After the toll booth, turn left onto Route 72 North. 3. 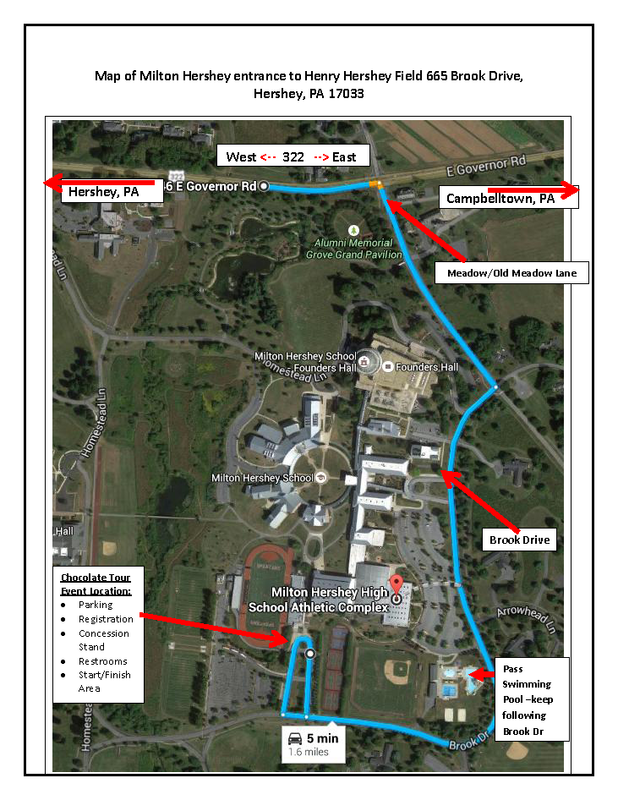 Follow Route 72 North to Route 322 West (Hershey) for about 15 miles. 1. Take PA Turnpike (I-76) East to Exit 247 (Harrisburg East). 2. Take I-283 North approximately 3 miles and follow signs to Hershey. 3. Take Route 322 East for approximately 9 miles to Hershey. 4. At traffic circle at the intersection of Meadow Lane and Route 322, turn right onto Meadow Lane. 1. Take I-83 North to Harrisburg to Route 322 East. 2. Follow Route 322 East for approximately 12 miles. 3. At traffic circle at the intersection of Meadow Lane and Route 322, turn right onto Meadow Lane.